If you’ve got an older home, you know there’s more to worry about than just the occasional creaking of old pipes. Making changes to historic homes — especially to roofs — can bring on headaches. Constructed in 1889, Scot Steele’s home recently needed a replacement for its old black asphalt roof. 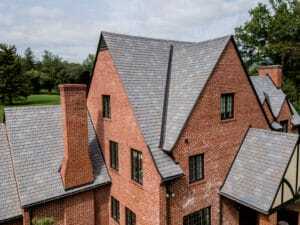 To help return the home to its original look, Steele invested in a DaVinci Single-Width Slate roof in Smokey Gray. For the Gilbert family, roofing headaches started when they were faced with replacing the cedar shakes on their historic 1929 cabin in Nevada. To solve this challenge the Gilberts relied on a fire-resistant composite shake roof from DaVinci Roofscapes. Reality and budget considerations helped homeowner Robert Ramsay to select DaVinci’s composite shakes for his 100-year-old farm house. What Ramsay found was the appeal of authentic-looking simulated cedar shake tiles from DaVinci. With a Class A fire rating, the Bellaforté Shake tiles installed on his home resist fire along with impact, high winds, algae and moss growth, and insect infestations. At an average thickness of one-inch, the Bellaforté Shakes reminded Ramsay of the original jumbo barn shakes previously on his roof. When Doug and Shanan Miller decided to do a complete renovation of their 1930 home they brought in Jeff Stimpson Contracting Corp to fulfill their vision. Rather than repair the heavy natural slate, the homeowners selected DaVinci Multi-Width Slate in Aberdeen featuring a blend of five colors: Dark Gray, Light Brown, Dark Purple, Green Stone and Dark Stone. According to homeowner Doug Miller, the DaVinci product exceeded their expectations. “It was very important to us to have a roofing product that resembled the original slate on the home when we purchased it,” says Miller. “We wanted to keep the look and character of the house the same.